Broadcast Live from Fenway Park, Boston! Harvard vs. Yale - 135th Playing of The Game! 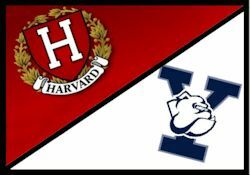 Join fellow Harvard and Yale alumni/ae for the live broadcast of The Game, the annual football classic between Harvard and Yale, first played in 1875. This year, the 135th Game will be played in Fenway Park, Boston! Doors open at 10:30 am. Kickoff is scheduled for 11:00 am Chicago time but may change depending on the broadcast schedule that week. The program includes a live telecast of The Game, and lunch (including; gourmet pizzas, hot dogs, unlimited beer, wine and soda). Harvard athletics door prizes are also included in the ticket price! Super Harvard insignia items will be given away to lucky door prize winners! Come cheer with old friends and make new ones! TIME: 10:30 am - doors open; 11:00 am - Kickoff Chicago time. Famous East Coast PIZZA, salads, hot dogs, and award winning brews! Tickets will be held at the door, but will be $5.00 additional if not prepaid. ... a total of 83 guests.